A lung nodule is defined as a “spot” on the lung that is 3 cm (about 1½ inches) in diameter or less. If an abnormality is seen on an x-ray of the lungs that is larger than 3 cm, it is considered a “lung mass” instead of a nodule. Lung nodules usually need to be at least 1 cm in size before they can be seen on a chest x-ray. Lung nodules are quite common, and are found on 1 in 500 chest x-rays, and 1 in 100 CT scans of the chest. Approximately 150,000 lung nodules are detected in people in the United States each year. Roughly half of smokers over the age of 50 will have nodules on a CT scan of their chest. What are the Chances That a Lung Nodule is Cancer? Smoking – Current and former smokers are more likely to have cancerous lung nodules than those that have never smoked. Occupation – Some occupational exposures raise the likelihood that a lung nodule is cancer. Medical history – Having a history of cancer increases the chance that a lung nodule is malignant. Shape – Smooth, round nodules are more likely to be benign, whereas irregular or “spiculated” nodules are more likely to be cancerous. Growth – Cancerous lung nodules tend to grow fairly rapidly with an average doubling time of about 4 months, while benign nodules tend to remain the same size over time. Calcification – Lung nodules that are calcified are more likely to be benign. Cavitation – Lung nodules described as “cavitary,” meaning that the interior part of the nodule appears darker on x-rays, are more likely to be benign. Infections – This includes bacterial infections such as tuberculosis, fungal infections such as histoplasmosis and coccidiomycosis, and parasitic infections such as ascariasis (roundworms). Inflammation – Conditions such as rheumatoid arthritis, sarcoidosis, and Wegener’s granulamatosis can cause lung nodules. 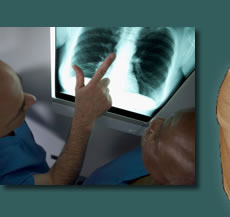 Benign tumors – Benign lung tumors such as hamartomas can show up as a nodule in the lungs on x-ray. Malignant tumors – This includes lung cancer, lymphomas, and cancer that has spread to the lungs from other parts of the body, among others. The treatment of lung nodules varies widely depending upon the cause, whether they are related to infections, inflammation, cancer, or other conditions. Most benign lung nodules, especially those that are present and haven’t changed over a period of a few years, can be left alone.